Harvey “Leonce” Huskins, 88, of Central Port Mouton and formerly of Lunenburg, passed away at the Queens General Hospital on Wednesday, May 12, 2010. Born in Port Mouton on February 8, 1922, he was the youngest son of the late Alexander and Addie (Doggett) Huskins. He worked as a laborer until he joined the Army in 1942. He went overseas the following year, serving with the Princess Louise Fusiliers at Aldershot, England for three years. He was a member of good standing of the Royal Canadian Legion Branch #23, Lunenburg. Upon leaving the Army he returned to Port Mouton where he was a fisherman and then soon took up the job of Lighthouse Keeper. He kept the light at Little Hope; Spectacle Island in Port Mouton Bay for seven years and finally Battery Point in Lunenburg which he kept for 25½ years until his retirement. 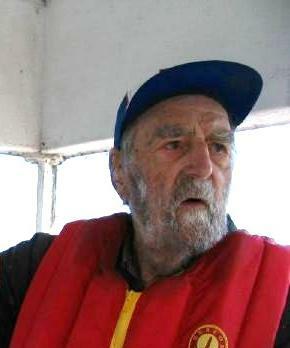 During his time in Lunenburg he helped establish the local chapter of the Marine Auxiliary Coast Guard. He enjoyed fixing lawn mowers & outboard motors, fishing, talking with friends, watching the Blue Jays and music. He often played with other local musicians. He played the guitar, mouth organ and a little accordion; his favorite piece of music was a hymn called “Mountain Railroad”. For many years he was a part of the world of CB radios, being a member of several clubs, as well as attending a multitude of C.B. Campouts over the years. He is survived by his wife Marion & daughter Rebecca, Central Port Mouton; son Robin & wife June, South Alton, Kings County; grandson Matthew & wife Nicole, Antigonish; great-grandsons Dean & Simon, Antigonish; granddaughter Miranda Shupe & husband Chris, Falmouth and great-granddaughter Anna, Falmouth. He was predeceased by brothers: Eddie, Douglas, Alman, George, Charlie, Chester, Clyde, Wilson and sister Violet in infancy. Cremation has taken place and there will be no service by request. Memorial donations may be made to the Royal Canadian Legion Poppy Fund or the Lunenburg Veteran’s Unit. So sorry to hear of Harvey’s passing. He was a nice guy with many stories to tell. Bob will miss his phone conversations with him for sure. Our sincere sympathy to all his family. We would like to send our condolences to all the family.We have lost a good neighbor and friend.We have only been here for almost five years but it’s like we had known Leonce forever.He was always ready for a little chat and we will miss that.Our thoughts are with you all. sorry for your loss Marion&Rebecca and robin. So sorry to hear of your loss. We have many memories of Leonce from back in the CB days. You are in our thoughts at this time. Our Deepest Sympathy in your time of sorrow, we will keep you all in our thoughts and prayers. I am so sorry for your loss. My deepest sympathy goes out to you Marion, and your family. To the family, I am trully sorry to here about Leonce, I knew him for short while from when I lived in port mouton..He always used to ask us boys how the fishing was.When he’d take his evning drive down to the causeway.He will be remebered for the stories he told,,and the things he taught me about outboard motors. Leonce was one of Mom’s oldest freind and school mate.She will certainly miss his humor and quick wit. I have know him for many years and will remember him with good memories.He will be missed by all of us.